Successfully Added Direktor Wifi Dual SIM Quadband Worldphone to your Shopping Cart. 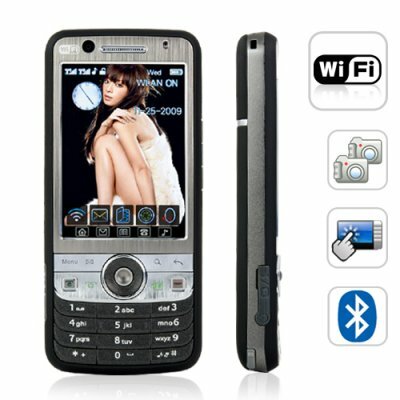 Powerful Wifi global-use cell phone with 2.8 inch touchscreen and classic barphone design. The latest edition to our mobile phone store, the M83 Direktor provides you with wireless internet surfing and worldwide connectivity with native quad-band GSM technology. Don't let the classic bar style of the M83 Direktor fool you, under the hood is a supercharged mobile phone capable of much more than any $400 phone you might get at your local phone store. This worldphone features (1) Wifi (2) Quadband GSM connectivity (3) Two SIM card slots (Dual SIM with Dual Standby) (4) Rich featured SMS, MMS, EMS, and Voicemail messaging options (5) Reaches a new level of versatility with cellphone multimedia features (an almost endless array - 12 choices in total). Surf the internet wherever a hotspot or wireless connection is available (which is everywhere these days!) - coffee shops, airports, libraries, restaurants, etc. And with its stunning array of web services like Google Maps for navigation, eBuddy which consolidates all your email and instant messaging accounts, Opera Mini for web browsing, and more. What you have with the M83 is more than just a mobile phone - you have a world class global communication device! This unlocked cell phone supports the four global standard GSM frequencies (850MHz, 900MHz, 1800MHz, 1900MHz) so you can trust it to work anywhere in the world. With its quad-band technology, you can travel from Russia, to Greece, to Italy, and then to the U.S. while still using the same phone during the whole trip. Having two SIM card slots with dual-standby, the M83 Direktor is perfect for people who want to keep two active phone numbers (personal and business) inside one smart phone. This is also a super convenient feature for anyone who travels between countries often. No more hassle of switches SIM cards in and out as you travel between Germany-Italy or United States-Canada. Now you can keep both of those SIM cards in the phone all the time! Text messaging and picture messaging is more than just a luxury these days, it really is a necessary function of any phone. When using the M83 Direktor you will can use an onscreen keyboard, button keypad, or your own handwriting to send messages. Send a regular text SMS, picture or video MMS message, send and receive email via the phones POP3 integration (EMS), or even send and receive voice messages, the choice is yours! Media to the extreme! TV and Radio (with a real receiving antenna), MP3 Player, MP4 Player, Two Camera Lenses (front and back), Ebook Reader, Accelerometer Motion Control, Games, Image Viewer, Photo Camera, Video Camera, Java, and Sound Recorder. If all those choices are not enough, then you can of course just surf the web to keep yourself entertained. What do you call a cellphone with all those features and a convenience in design + performance that is speedier than many smartphones on the market today? It's the M83 Direktor. The first new "killer mobile phone" of 2010! The M83 Direktor is in stock and available for immediate shipment. Buy a single piece to test this awesome mobilephone for yourself and then buy in bulk to receive the lowest possible price and save on per unit shipping to your local warehouse. This exciting new cellphone is presented to you exclusively by the leaders in China Wholesale Electronics, Chinavasion! With 21 languages to choose from, you will be saying "Como está?" and "Hur mar du?" in your favorite language by any method you choose. Gizmo5 is a Skype alternative which allows you to free chat and talk with other Gizmo5 users or call non-Gizmo5 users on their landlines or mobile phones at a very low price. To learn how to install Gizmo5 on The Direktor, read our blog post entitled: Gizmo5, A Review And Install Of The Number 1 Skype Alternative at blog.chinavasion.com. Thanks for your fast and great service!!! Tenho à algum tempo e não me arrependo muito bom telefone. As the heading states, this phone has simply blown me away with its features and the way it performs. I was very sceptical of having 2 SIM cards, as I didn't believe it would work here in Australia - I use Telstra for work and Optus for personal use, and it works with no problems at all! The finish is just acceptable, as the buffed alloy look of the buttons has a laminated/fake appearance. But for the price, it simply crunches the brand name phones for dead. Great cell phone for a good price, wifi works very well, Analog TV is also great (no digital tv), touchscreen works fine. Thanks again Chinavasion for the selling great products for good prices.